What color grout did you use on the floor? What brand is the shower fixture? 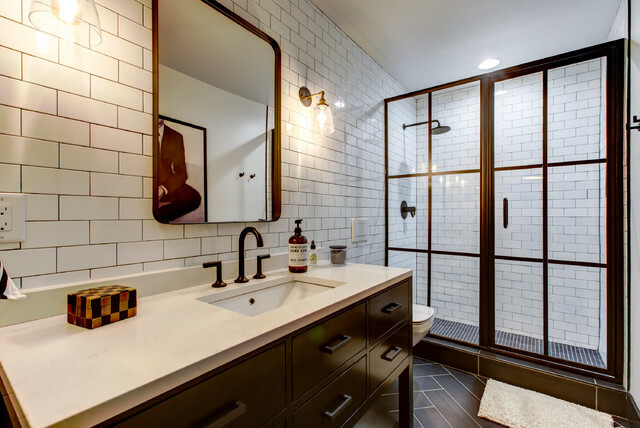 What size subway tile is used? where can I buy the shower door? thanks! All of their shower doors are custom sized. The frame material is aluminum. Call Carolina Glass & Mirror at 919-662-9050.
mirror is awesome. any idea where it came from? - mirror is awesome. any idea where it came from? That is actually a Bristol Flat Mirror from Restoration Hardware. Glad you like it! HERRINGBONE floor - what type of tile is this on the floor? What color grout did you use on the floor? Looks great. This bathroom is 5' wide x 11' long. Where can I find the shower head and valve? The fixtures in this bath are mostly Brizo, including the shower arm, head and valve. We purchased these through Wilkinson Supply in Raleigh. That is a Restoration Hardware La Salle Wash Stand! what’s the dimension on the subway tile? - what’s the dimension on the subway tile? I don't have that information in my records, but based on the scale of outlets in other pictures, it appears they are 3"x6" subway tiles.